Enjoy the unique style of Byron at Seaside Beachhouse. 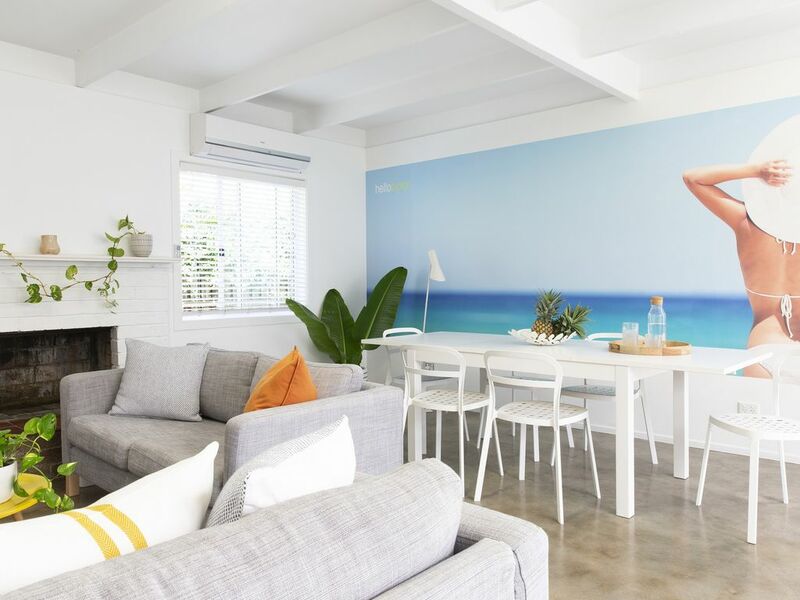 This cool, breezy beach house, inspired by 'palm springs in the 50's' has a stylish interior with white washed walls, polished concrete floors and open plan living which flows out onto spacious undercover entertainment areas. Seaside Beachhouse is situated opposite beautiful Tallows Beach in trendy Suffolk Park with a patrolled beach at your doorstep. Pets are catered for at the beach 100 metres further along. After a day on the beach, enjoy a game of volleyball in the large, tropical back yard, laze on the deck chairs soaking up the sun or take a leisurely 250m stroll to all the local restaurants, cafes and shops. Take the cycle path down through the national park and on in town for some exercise, Seaside has it all for that memorable beach holiday. Guests bringing pets must identify size and type at the time of the booking request. Lovely home to relax and entertain. Close to the beach, well stocked with all holiday needs. Perfect holiday home. Maimi meets Suffolk park. Greg and Lynn provide a beautiful space to chill and enjoy the environs of Suffolk and Byron. This is my second visit and it certainly won’t be my last. This place deserves a ten star rating. A gorgeous place, and our hosts were so , extremely helpful. If I could give this property a 10 star rating , I would. Greg and Lyn the most fabulous hosts!! Their beautiful home, immaculate and every detail has been carefully thought through. A gorgeous, coastal home, love your decor💙�. They provided us with all the local tips of where to dine and places to visit. What a wonderful testament to this beautiful area. Beautiful house that had everything we needed for a 2 night stay. We stayed for 2 nights in this beautiful property. The location was perfect for us, away from the busy hub of Byron Bay Main Street but still right near the beach. The house is really well set up and located within walking distance of the local SPAR supermarket, bakery and bottleshop. We only wish our stay was longer. I’d highly recommend this property and would stay again if I was back in the area. really good for a group, lots space for everyone! loved our stay, only wish we had stayed longer! thanks ali, glad your stay went well and you had a good time !! Lovely clean, comfortable house that had everything you could possibly need, they've literally thought of everything. Fantastic location with just a short walk to the beach and handy to shops. Greg was nice to deal with too! I just stayed one night but the property was perfect! thanks melissa glad it went well! !